Meghmani Organics Ltd. (MOL) is an India-based chemical company with varied business interests. It has three business segments namely pigment, agrochemicals and basic chemicals. MOL has presence in more than 75 countries, serving over 400 customers across all three business segments. It has a distribution network with subsidiaries in USA, Indonesia, Dubai, Europe, a representative office in China and warehouses in Turkey, Russia, USA and Uruguay. It also has seven manufacturing facilities in India. Pigment is the oldest segment for the company, started in 1986. It is amongst top 3 Phthalocyanine based pigment players globally with a 14% market share. FY18 revenues were Rs.587.7 cr (32.6% of consolidated revenues) & operating margins were 14.4%. The Company is a vertically integrated pigment player producing CPC Blue which is sold to other pigment manufacturers & thereafter pigment blue & pigment green which are sold to industrial users. These have robust demand due to multiple applications – printing inks, plastics, paints, coatings, textiles, leather, paper and rubber. Paints, coatings & plastics, especially from automotive industry have been major growth drivers. The agrochemicals segment was started in 1995 & the Company is one of the largest producers of pesticides in India being present across the value chain. FY18 revenues were Rs.642.3 cr (35.6% of consolidated revenues) & operating margins were 15.3%. 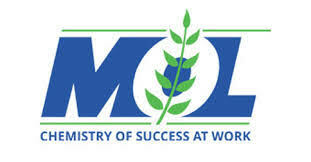 MOL is a leading manufacturer of pesticides products in India across the value chain. It has 567 registrations, 333 registrations in pipeline, 35 registered trademarks & has quite a few well-recognized agrochemical brands (Megaking, Megastar, Megacyper, Megaban, Synergy, and Courage). Major products include 2, 4-D, Cypermethrin, Permethrin, Chlorpyrifos and Profenophos. It produces agrochemical products across entire value chain (intermediates, technical and formulations). Basic chemicals division was started in 2009 & the Company is the 4th largest caustic- cholorine player in India being one of the lowest cost producers of caustic soda in India. FY18 revenues were Rs.597.5 cr (33.1% of consolidated revenues) & operating margins were 42.7%. The Company has also set up a new 60 TPD caustic potash plant. Caustic soda is used in in soap & detergents, pulp & paper, textiles processing, organic & inorganic chloro solvents. Cholrine is used in PVC manufacturing, dyes & dyes intermediates, organic & inorganic chemicals, drinking water disinfection, pharmaceuticals. Soda ash is used in glass, soap & detergent and silicate production & caustic potash is used in soaps, detergents & fertilizers chemicals. Exports constitute of nearly 80% of pigments. About 2/3rd of agrochemicals & about 5% of base chemicals. Overall about 52% of revenues come from exports. About 15% of the total raw materials consumed are sourced from China. The raw material prices have gone up because most of the raw materials are crude linked. MOL’s backward integrated facilities put it in an advantageous position, given the current rising raw material prices. MOL is constantly improving capacity utilization and completion of on-going Rs 640 cr capex (for 3 projects) will further provide significant scope for growth over the next few years. The Company is setting up a 40,000 MTPA chloromethane (CMS) plant to produce MDC, Chloroform & Carbon Tetra Chloride (with capex of Rs 140 cr) to be commissioned by December 2018. The peak revenue potential of the plant is Rs.170-180 cr. The Company is also expanding its caustic soda capacity to 2,71,600 MTPA and captive power plant capacity to 96mw. MOL is also adding a hydrogen peroxide capacity of 30,000 MTPA. Additional capacity in the high margin basic chemicals segment will further drive the overall EBITDA margin for the Company. The new facility is expected to commence operations by June 2019. The Company has already spent about Rs.175 cr from internal accruals & a large part of the remaining capex is likely to be funded from internal accruals only. MOL has consistently been improving profitability over the last few years which have led to significant improvement in return ratios. EBITDA margin has improved from 16.6% to 23.9% between FY14-18. ROCE improved from 8.7% in FY14 to 23.9% in FY18 while ROE increased from 6.0% in FY14 to 24.2% in FY18. The Company has also maintained a lean balance sheet due to strong FCF generation of Rs. 368.5 cr over FY14-18. Cumulative debt repayment during the period was Rs 331.3 cr. D/E reduced from 1.24x in FY14 to 0.35x in FY18. MOL has guided for a revenue target of Rs 1000 cr each for agrochemical, pigment and basic chemical segment by FY21 (implying 18% revenue CAGR).